Hamburg, Kampnagel – August 2012. Held as part of Kampnagel’s Summer Festival in Hamburg, the workshop is Act 1 of What is Enough? the Labofii’s 16th experiment. At the end of the workshop, participants will have the chance to perform in a live piece of art activism (Act 2 – Natural Revenge). 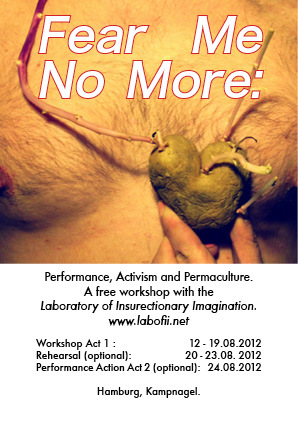 Fear Me No More aims to make productive connections between artists and activists within the framework of Permaculture. 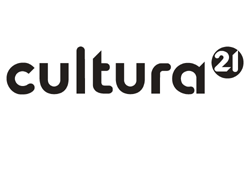 A set of tools for building a postcapitalist society, Permaculture teaches us to mimic the efficiency, diversity and resilience of natural ecosystems. This fulltime workshop is an ideal introduction for those wishing to explore new forms of creative resistance and horizontal politics. For more information and application forms (deadline May 31st) click here. The workshop will be run in English.